A Unique Mind – Ralph has a particular view of the workd that is a couple degrees off kilter, which means I love his material. If you like looking through some lenses that are creative and entertaining then read this book. 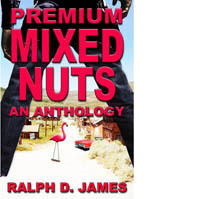 A short review of short stories – Ralph James makes me laugh. He’s a good writer, knows how to craft a good story, and is an all-around fun person. Read this book. It won’t disappoint. Quirky characters and fun plots – Ralph is able to grab your interest in the first sentence with his fun descriptive narratives. He fully develops quirky characters and outrageously bizarre plots that are somehow totally believable. Enter his world and enjoy a good and completed short story, no wondering where the story is or how it got there at the end. A collection of witty stories, many from the old west – Cleverly written tales with unique plots and interesting outcomes. You’ll smile as you read and be amazed with how things come together at the end of each story.